Hi Guys! I hope everyone had a great weekend! Okay, so today’s post gets a little personal. I’m sure many of you have noticed that neither Teri or I often get very personal in our posts. We tend to do that for a few of reasons: Both of us are a little bit on the shy and awkward side. We don’t consider ourselves the best story tellers or writers and it can get a little intimidating and daunting for us. Finally, we really try to put our work in the forefront because it’s something that means a lot to us. Today is a little different though. Today I want to share something very personal and very important to me. About a little over a year ago, my best friend in the entire world was diagnosed with Multiple Sclerosis (more commonly known as MS), just after her 30th birthday. MS is an often debilitating disease that affects the nervous system, disrupting the flow of information between the body and the brain. Before getting into that a little more, I really want to take a quick second to talk about the amazingness (sure that can be a word, why not), that is my girl Tristan, and our background together. We met about 13 years ago, during our Freshman year in college, while attending UC Santa Barbara. We lived down the hall from one another in the dorm rooms, and officially met about a month into our college experience. I think for both of us, it was like a ‘moth to a flame’ situation, we were just totally drawn to each other and from then on, we were inseparable. Seriously though…our friends even teased us a little bc we were ALWAYS together, always wanted to room together, were infamously couch potatoes together, always skipped class…or even skip out on parties together…usually to watch just one more (but really more like 6-7 more) episodes of LOST. What really drew me to Tristan initially is just how upbeat, energetic and infectious her personality is! She’s so outgoing and absolutely hilarious, which I think is the opposite of me (shy, quiet, awkward). She’s one of those people that everybody absolutely loves to be around. I can not think of a single person in the world that meets Tristan and doesn’t fall 1000%, head over heels in love with her. She LOVES to sing at the top of her lungs (despite her terrible singing voice…sorry girl! haha) and dance like there’s no tomorrow. Oh and did I mention she can rap…VERY well? Like…can rap Bone Thugs n’ Harmony’s, ‘Notorious Thug’ PERFECTLY and in its entirety without skipping a beat? It’s so weird, but so incredibly AWESOME at the same time….like when she won free concert tickets, on the radio, for RAPPING; and this was only a few years ago, as she was driving herself to work…to her very grown-up job in downtown Seattle. Yea, she’s awesome. She’s also incredibly smart and organized. Tris and my sister are currently planning my bachelorette weekend together and I keep getting texts from my sister saying, ” I LOVE planning the weekend with Tristan. She’s so organized, on top of everything and SO easy to plan things with.” I’m not surprised at all though, because on top of Tristan being outgoing, fun-loving and hilarious, she’s also one of the most dependable and trustworthy people you’ll ever meet. Ever. No exaggeration. Everyone should be so lucky to have a “Tristan” in their lives. This is the beginning of MS Awareness Week and in just about a month, I’m flying up to Seattle to participate in an MS walk with my girl. If anyone should feel the desire to donate to our team and cause, it would be greatly appreciated and you can make a donation here as well as read more about the organization behind the walk. More importantly, if you all can take a minute to help spread a little awareness to others about this disease that there is currently no cure for, it would also be greatly appreciated! So as we enter MS Awareness Week, I wanted to do my teeny tiny part in bringing awareness to this scary, debilitating and very unpredictable disease and dedicate today’s recipe to my incredibly brave, smart, funny, well loved, kind, garlic and carb loving leading lady in my life! She has handled this situation that she has been put in with nothing but an enormous amount of positivity and grace, but no surprises there because I wouldn’t expect anything less from this incredible woman. Thank you all so much for taking your time today to read this, it truly means the world to me and I know Tristan wholeheartedly appreciates it too. 2. Add a handful of salt followed by the pasta and boil for 5 to 6 minutes or until the pasta is cooked through. 4. Place a large skillet over medium-high heat and add oil and butter. Once butter has melted add shallots and garlic and sauté for 2 to 3 minutes. Add pasta, season with salt and pepper and toss together. Lower heat to medium. Add lemon zest and juice and continue to sauté for 1 minute. 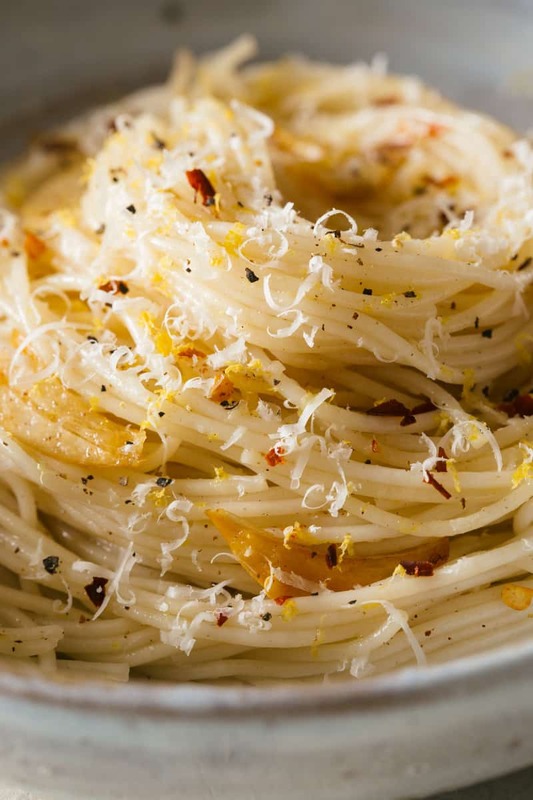 Finish pasta with additional lemon zest, a sprinkle of crushed red pepper flakes and a generous amount of freshly grates Parmesan. Sorry to hear about Tristan- it seems like her attitude can help her stay positive. I am a dietitian and in no way affiliated with the video linked below. I watched this and it BLEW MY MIND. I think everyone with MS should give it a shot! The power of nutrition can be extraordinary. Dr. walls was able to get up out of her wheel chair and walk by eating vegetables. Thank you so much for sharing this link, it’s so helpful! I will definitely forward it on to Tristan! Thank you!! So lucky to have both a Tristan and a Jenny in my life! Tristan sounds like an amazing person and I think that you’re both great storytellers. Can’t wait to try this recipe! What a gorgeous recipe with such an inspiring story. First of all, YUM! This is definitely my kind of pasta. I’m very sorry to hear about your friend. I pray that she can beat thing, and the same for all of the people who have been affected by ms. 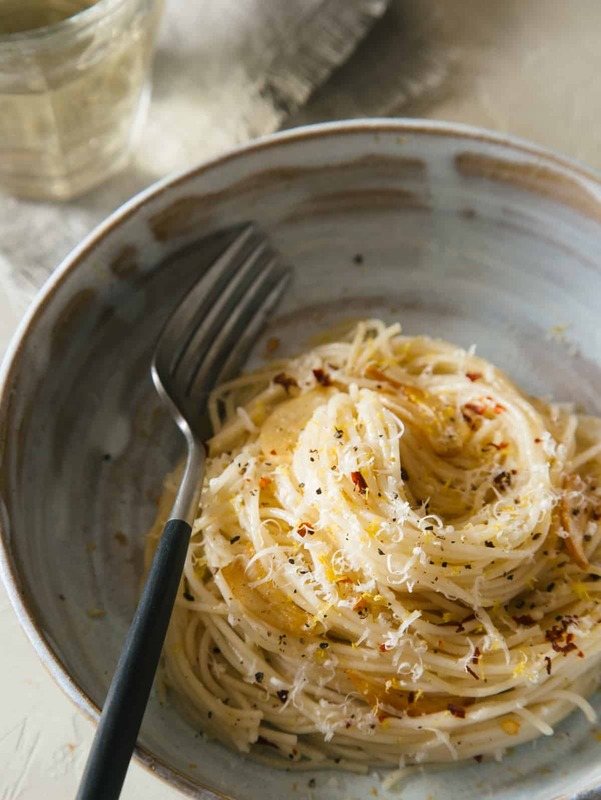 I love a classic and simple pasta dish. This looks incredible. Thank you for sharing your story with us. It is good to stop and recognize the beautiful people in our lives and it sounds like Tristan is one of those for you. Blessings to you and your friend. The recipe looks fabulous! I will share your site with others (esp. due to your testimonial about Tristan, my second cousin). Yes, she’s hilarious (…remember the ‘teeth’ at her wedding?) 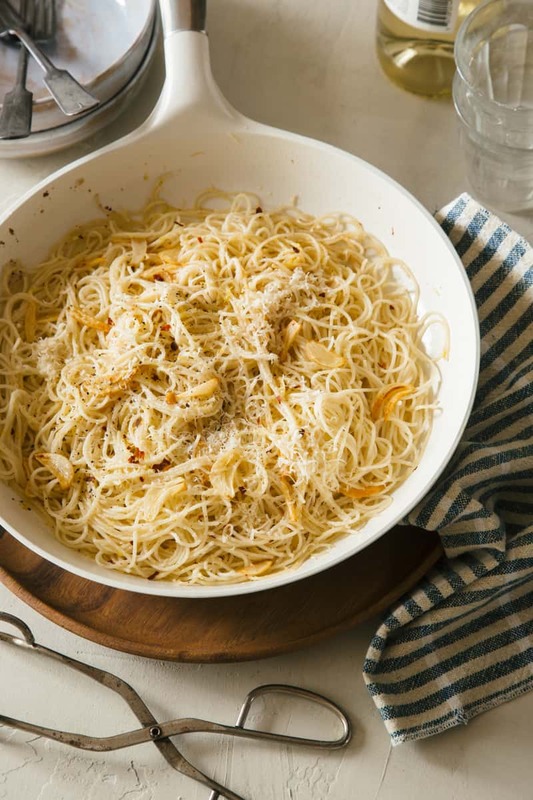 Laughter is the best medicine, and pasta helps too! Thank you so much!! LOVE our girl, Tris! Thank you so much Jenny for the wonderful thoughts,comments and stories regarding your great friend and my daughter Tristan. You are one classy lady! Thanks so much for this. It’s great to show awareness in another form instead of the reams of medical posts and info online. This is refreshing. I was diagnosed with relapsing remitting MS in 2012. I’m not on meds, I manage it. I note that stress is a major factor for me. When I’m having a hard time I feel it. Diet is important too I agree, so I’ll be watching that Ted talk. All the best Tristan and to her support network.